I've recently posted a couple of posts about helping to perfect your base (check out my posts about hair removal and clearing up shaving irritation and on the Omorovicza Refining Facial Polish). Think clearer skin, even skin tone, brighter, smoother skin, and so on. Whilst we had a couple of lipstick posts in between, today I'm back with what can only be described as a cult classic item to discuss with you all and I'm sure it needs no real introduction. 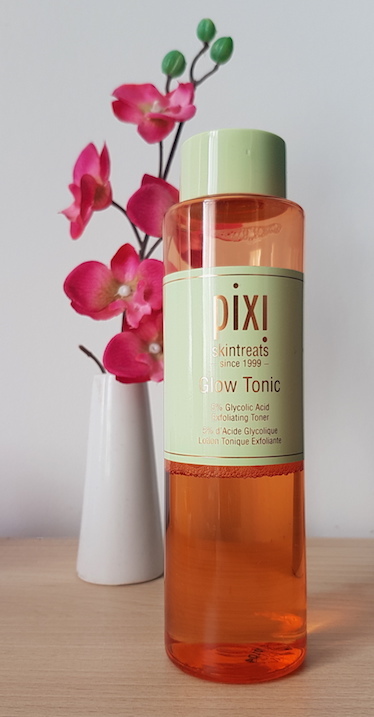 The Pixi Glow Tonic is an exfoliating toner that promises to remove dead skin cells, tone, brighten and firm the skin. It contains Glycolic Acid to exfoliate, Aloe Vera to soothe and ginseng to energise. It also contains Witch Hazel which is a great ingredient to help with blemishes too. 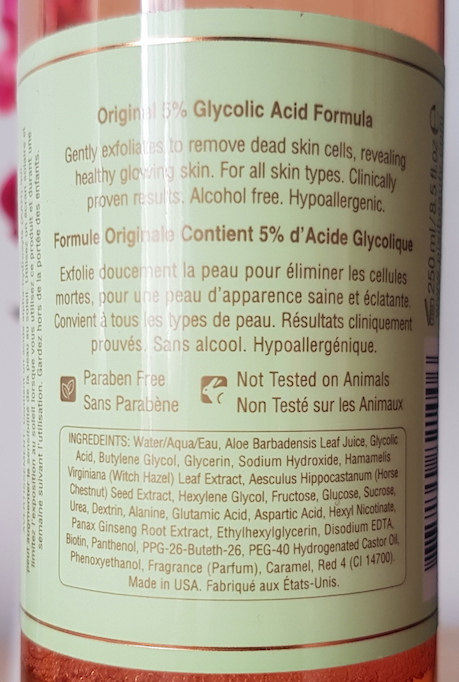 It's suitable for all skin types, is alcohol free, not tested on animals and is hypoallergenic. 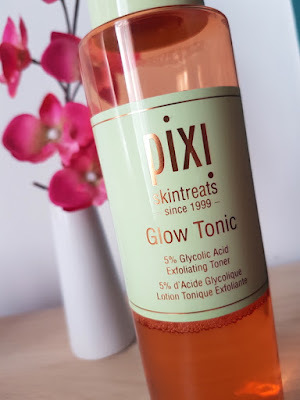 A lot of folks have had great results with the Pixi Glow Tonic in regards to reducing the appearance of acne/blemish marks, evening out the skin tone, diminishing blackheads and creating a healthy glow. It comes bottled in a transparent orange bottle with both a green label and screw cap lid and the bottle holds either 100ml or 250ml of product. The toner itself is clear in colour, but if you've either seen or used this product in the past you may be aware that it used to be orange in colour. The Glow Tonic has gone through a minor re-formulation a couple of years back, and if you would like to know more about it I do recommend this fantastic post that goes into a lot of detail regarding the differences. To use, dispense some of the toner onto a cotton wool pad/ball and gently sweep across cleansed skin. Allow the skin to dry off a little before following up with a serum and/or moisturiser. It can be used either in the morning and evening, or just once a day during either the AM or the PM, depending on your preference. I've been primarily using this at night time but sometimes I have used it in the morning too. I think it's important to say that it's not one of those products that gives you instant results. You need to give it a few weeks before you notice a significant change, but once you see it you realise it's worth it. I find that it does a great job at reducing scarring from blemishes as well as removing any dry patches. It also helps to reduce the size of any current spots on the skin too and they disappear faster. In addition to that, it also gives the skin a healthy looking glow. I say healthy because oily skinned folks can hear the word glow and start cowering, we have enough of a natural greasy glow as it is! Don't worry though, fellow oily skinned folks! It leaves the nice type of glow, even on oily skin. Not a greasy finish. As with other chemical exfoliants, some folks may experience a slight "purge" of the skin, which usually consists of small blemishes appearing whilst the dirt is being drawn from the pores. Don't be deterred and keep working through and you should garner some fab results. The downside of this toner? It's always selling out too quickly, particularly in places that frequently offer discounts (think Look Fantastic). Because of this, I have added a couple of places of purchase at the end of this post rather than just one to provide a couple of extra options in the case of one being sold out. The only other problem I've had with it is to do with the lid. Inside the lid there is a small white circle that prevents leaks, but in my bottle it's always moving around and usually falling out when I open the lid. Because of that, I have encountered a couple of leaks with it. This shouldn't be too much of an issue if it's always stood upright on your counter, but does pose a minor issue in the event of travelling with it. Perhaps it's just this one particular bottle, but just in case, keep it in mind and potentially be ready to take other precautions when travelling with it by using some cling film or tape etc. No matter your skin type, this is a fantastic toner that I feel is worth the majority of the hype it receives. Saying "majority" sounds like I'm being somewhat negative, but I really don't mean it in a bad way against the product at all, only towards the effect it can have on ones expectations. When a product is really good, it can get hyped up to be the most incredible product ever invented, and this can raise your expectations to the point where even good results aren't impressive enough. This is a great toner and I recommend it for anyone looking for a new toner to try. As long as you don't go into this expecting overnight results and every skin issue you have to be fixed 100% with no effort, you will be impressed. Do follow the hype, try it, get great results and love it, but don't get swept away in the "over-hype" and expect miracles. That advice goes for pretty much every hyped up product as I find that it helps you to appreciate its greatness far better if you don't expect more from it than is possible to really achieve from any product on the market. You can purchase the Pixi Glow Tonic from Look Fantastic, Cult Beauty and Asos. What are your thoughts on the Pixi Glow Tonic? What's your favourite toner?